This section provides an archive record of the dispute between the residents of Ladycroft Park and Sines Parks Ltd in 2005-6 and its aftermath, as reported in the Blewbury Bulletin. The events are presented in reverse chronological order, i.e. the most recent appear towards the top of this page and the earliest at the bottom. It is is intended mainly as a resource for other park home residents around the country who may be experiencing problems with their site owners. For further information please contact Sheila Austin, Secretary of the Ladycroft Park Residents’ Association. The story of the legal battle which took place over Ladycroft Park in 2004-2005, between the then owner, Maurice Sines, and the Residents’ Association was described in the Radio 4 programme ‘Face the Facts’ on 27th August, repeated on 30th August. As most people in Blewbury will know, the residents had a resounding victory in Oxford County Court. Ladycroft Park has since been sold (twice in fact) to new owners. The content of the programme can be read on the BBC web site at http://news.bbc.co.uk/1/hi/uk/8222356.stm. The result at Blewbury was a great achievement by Sheila and her fellow residents, and compares with much less satisfactory situations at various other mobile home parks (owned by various owners) up and down the country. A significant aspect in Blewbury was that the village as a whole gave the Ladycroft residents a lot of practical and psychological backing – something Blewbury can be proud of. But strong government legislation to limit what mobile home park owners can do is still needed, as the BBC reporter makes clear. We are very pleased to report that the sale of an older home on Ladycroft Park has been successfully completed, the first in six years. We are all obviously delighted, as this was one of the main problems we had when Mr. Sines owned the Park. This is a huge step forward in restoring peoples confidence in the future of Ladycroft Park, particularly for our residents. We have more good news: Graham, whose home was seriously damaged by an arson attack, still unsolved, now finally has a new home on the Park after waiting well over a year. Mr. Best, in contrast to the two previous park owners (Sines & Barney), agreed a price within Graham’s insurance company’s building cover and in turn the manufacturer’s listed price, to ensure that a new home was delivered and sited on the Park. For this we thank Alfie Best. Mr. Best has also ensured that Mr. Tulloch has been able to keep his home on the Park (Mr.Sines illegally obtained Mr.Tulloch’s home five years ago). Since then Mr. Tulloch was renting the home but it is now back in his full ownership. He has since and still is having his home refurbished and it is beginning to look as good as new. As far as we know, four new homes have been ordered and sold on the Park. Since the appointment of Steve O’Shea as Park Manager, communication between the residents association and Wyldecrest Properties Ltd has greatly improved. Only this week Mr. Best informed us that plans for Ladycroft Park have been drawn up, and that we will soon be in possession of the said plans. This in itself is progression. On behalf of the LPRA we would like to wish our members, all the villagers and the staff of Wyldecrest Properties Ltd a Merry Christmas and a Prosperous New Year. As many of you have probably seen there has been some progress made on Ladycroft. We would like to take this opportunity to welcome our new manager, Steve O’Shea, to the Park and of course to the village. We are all now hoping that with the appointment of a manager and other workmen on the Park, there will be more rapid progress on the Park. Brookwoods, one of the main estate agents for mobile homes in the area, are advertising new homes for sale on Ladycroft Park which is also good news. There is still a long way to go yet but at least we seem to be moving in the right direction, after 6 years of being trapped in a nightmarish living hell. The residents of Ladycroft and the village all want the same thing, the full restoration of Ladycroft Park and to live in a place that we can all be proud of. Thanks once again for all your support and concern. The residents of Ladycroft, on hearing the news on Wednesday morning that the Park had been sold again, have been left shell shocked and bewildered. A man appeared on Sheila’s doorstep, introduced himself as Alfie Best the owner of Wyldecrest Properties and announced that he had bought JDR Developments Ltd, Ladycroft Park being part of this company, from Mr Barney. Mr Best has expressed his wish to work with us and to carry out the necessary works on The Park. He has agreed to meet with the committee of the Residents Association on Monday 23 rd April to discuss future plans for Ladycroft Park . For obvious reasons we are extremely wary of any new owner taking over Ladycroft; we were promised the earth by Mr. Sines then the same by Mr. Barney and now by Mr. Best. Time will tell and actions always speak louder than words. Thank you once again for your support and we will let you know as soon as possible of any new developments surrounding Ladycroft Park. Ladycroft Park was officially bought and taken over by Mr Anthony Barney of JDR Developments Ltd on 16th January 2007. Since then all the other Parks that are owned by Mr. Barney have also been in touch with us and are very pleased to have us on board! Mr. Barney has expressed a wish to work with us and to carry out the necessary works on Ladycroft Park . He has recently contacted us by letter and stated that hopefully work will commence on the Park in approx 6 weeks time, (although no precise dates have yet been given). We all very much hope this is true, because as many of you know Ladycroft Park is in a terrible state and has been for a long time. Not only with the rubbish strewn around the Park, old furniture, electrical appliances and mounds of earth littered with rubbish, but the whole infrastructure of the Park. For example we have one old defective drainage system that means that we regularly have raw sewage spilling into people’s gardens, and along side it we have part of a new drainage system put in by Mr. Sines’ contractor that if connected up to our homes, would not work because sewage does not run up hill. This has been confirmed by the head of building control at the Vale Council. As a consequence of this the roads have been dug up and not yet been relaid properly leaving them in a hazardous condition for both pedestrians and vehicles. They have been in this condition since September. On Friday 16th March we had a meeting on the Park with Mr. Ed Vaizey MP (to whom once again we would like to offer our thanks for his continued support of Ladycroft Park), Councillor Farrell, Martin Brassell chairman of the Parish Council, Paul Staines and Ian Forster from the VWHDC. It was a purposeful meeting and many topics were covered. The general consensus was that the tragic events of the past 5 and half years must never be allowed to happen again .It is vital that all the parties involved strive for the same goal in restoring the Park to a place where people are proud to live and befits the village of Blewbury . We would like to take this opportunity to thank all those villagers who attended the Parish meeting held on Monday 19th to discuss the ongoing situation on Ladycroft Park for their continued support, and to many other villagers who could not attend but who also show their support in many other ways. JDR Developments Limited has agreed to undertake all of the matters on behalf of the Defendant (Maurice Sines) in respect of the Oxford Court Order dated 21st October 2005. Thank you once again for your support and we will let you know as soon as possible of any new developments surrounding Ladycroft Park . Two MPs at one village meeting! On Saturday December 2nd there was a very friendly meeting when the Ladycroft Park Residents Association hosted a visit by a coach load of residents from Avonsmere mobile home park in Bristol and also some residents from Chilton Farm Park in Hampshire which are both owned by Mr Sines. The Ladycroft residents showed the visitors round the park, emphasising the importance of being aware in advance of possible plans by park owners, and of the importance of staying united. Some of the “Silent Witnesses” were also invited to chat to the visitors about how they had tried to help with both moral and financial support. The weather was kind, and after the walk round the park everyone was treated to a wonderful generous sit-down lunch provided by Sheila Austin, assisted by residents of the park and “Silent Witnesses” in the Village Hall. Both our own MP Ed Vaizey and the MP for Bristol North West , Dr. Doug Naysmith, were there, and it was good to see two MPs from opposite sides of the House of Commons united in their keen support of mobile home park residents. Also present were District Councillors Roger Hutchinson, Bristol and Richard Farrell from the Vale Council. Dr. Naysmith who was later shown round the park was horrified at what he saw and said that it should have never been allowed to happen. There are still considerable problems on the Blewbury park, and the residents still need any help that the rest of the village can provide. We are extremely lucky that we have not lost one of our valued residents of Ladycroft Park and Blewbury. At approximately 12:30am on Tuesday the 5th September a fire was deliberately started outside the home of Graham Dale No: 20 Ladycroft Park. 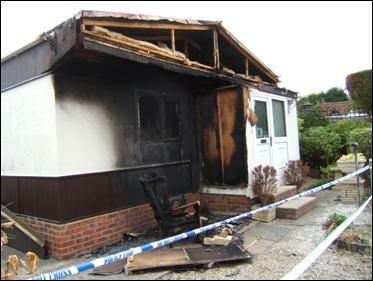 An armchair was deliberately placed in front of the mobile home and adjacent to Grahams car, and someone or persons then set fire to the chair which then set the back of the car on fire. Fortunately Graham woke up and could see the flames coming from the back of his car from his bedroom,. He managed to get out of his home. By the time he got out his mobile home had caught fire. I awoke at approximately the same time hearing noises outside my home, I looked out of the window and could see the flames. I ran outside, screamed to make sure Graham was O.K. then I went back inside to call the fire brigade. In the meantime Graham, realising the seriousness of the car being alight, went round to the side of the mobile home to get his garden hose, which thankfully is always connected. He aimed this at the car. By this time neighbours had woken up and rushed out to help. Without their help and Graham being able to keep the car fire under control, lives and more homes may well have been lost. The fire officer later told us that if the petrol tank of the car and gone up it would have reached many homes surrounding it. The police are treating this incident as a very serious crime and are further investigating and following several lines of enquiry. As everybody knows we have had many problems on Ladycroft over the last few years and unfortunately the problems continue, anti social behaviour, drugs, police raids, stolen cars & loud music to name but a few. The 26 residential homes on Ladycroft are still continuing the fight. All we are asking for is to be able to live our lives in peace and to have Ladycroft Park put back to a state that is in keeping with the village. We would like to take this opportunity to thank all the well wishes that Graham has had including the Parish Council and Ed Vaizey our local MP who is continuing to show his support for Ladycroft. We would also like to thank the fire service, police, Red Cross and other voluntary organisations for their help and consideration on the night of the fire and their ongoing investigations and of course our neighbours who risked their lives to help. First, thank you to all who came to the meeting, and also to those who told me that they would have liked to come but were couldn’t make it for one reason or another. There was not, I am afraid, a great meeting of minds between the Vale’s officers and Ladycroft’s residents and neighbours. However, it gave both sides the opportunity to raise in public their concerns and a number of issues were flagged up for further action and/or investigation. It is my intention to hold a further open meeting in two or three months time – this time on an informal basis rather than a full Parish Meeting – to review progress and any subsequent developments. Look out for details in the next Bulletin. It can then be decided what further action and/or meetings, with or without Council officers, may be helpful. Resited old mobile homes for rent, (some unfit for human habitation and some contravening site licence conditions), are back on the Park. With this comes the repeated threat of Mr Sines when he doesn’t get his own way. Remember what he said on the recording played on the Inside Out Programme? He implied that he would fill the Park with drug addicts and the likes. We have already had signs of this happening by the presence of the police and amongst other anti-social behaviour, loud music and rubbish collecting around the rented units. Due to the increased capacity on the Park we have major problems with spilled sewage. Whilst constructing the boundary fence the phone lines have been seriously damaged and two thirds of the residents have been without phones for over a week. The response to the petition sent to V.W.H.D.C. from the residents around the Park was in short, “due to the complicated nature of the powers, duties and restrictions on the council we are unable to act”. Mr Sines is disputing the total costs awarded against him even though our court costs (for twenty five residents) were actually lower than his own. We are waiting for a date for an assessment hearing in London . 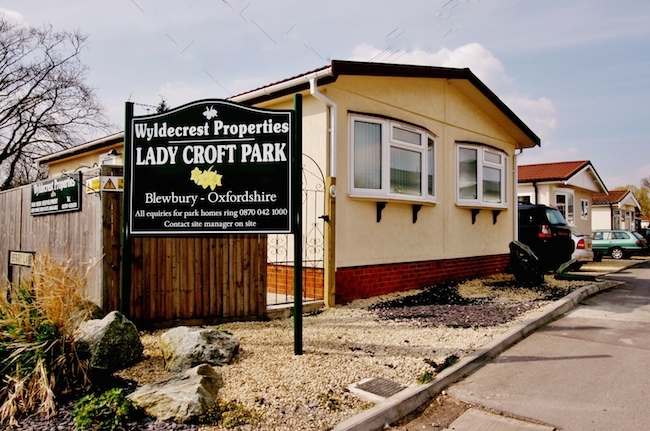 Ladycroft Park was, and always has been, a residential park with approximately 50 or more park home owners. Only 26 remain. The residents chose, and bought, to dwell permanently on the Park and in the village. Mr Sines introduced, without consulting residents, the temporary rented accommodation, and then evicted them for his re-development plans. The rest is history. He has now re-introduced renters and has stated in writing that this is only a temporary measure. How long is temporary? But he has also stated verbally that he will never redevelop. Mr Sines has quoted “I don’t live there so I don’t have to look at it”. Who would now choose to buy and dwell permanently on the Park? What social impact will there be if temporary rented numbers outnumber the permanent ones? Some of you will have noticed lorries bringing Park Home units into the village. Mr Sines has informed us that, for the time being, he will be bringing second hand units onto the site and renting them out. The Ladycroft Residents are not happy with this situation and are looking into what can be done about it. In November Mr Sines contacted us to say that he had had an offer to buy Ladycroft for £4,000,000 and he invited us to match the offer. Our advice was that the site is not worth £4,000,000 and so we did not take him up on the offer. Mr Sines is talking of starting the work to repair the drains in January and, as far as we know, the site does not appear to have been sold. On Tuesday 17th January at 7.30 the BBC 1 Watchdog programme featured problems at mobile home parks which included information supplied from Ladycroft. In the Norfolk area on Monday 16th January BBC 1 Inside Out featured the King’s Lynn site and the problems residents are having there. A preliminary hearing for a court case to be brought by King’s Lynn residents is to take place on 20th January at Norwich. The Housing Act 2004 gave the Secretary of State the power to change the implied terms in the Mobile Homes Act 1983. One of the terms that the Minister intends altering, unless she can be deflected in Parliament, is to change the circumstances in which a site owner can require a home to be moved, specifically to allow site owners to move homes for the purpose of redevelopment. This would give legal certainty to the very thing that Ladycroft has been struggling against and carte blanche to unscrupulous site owners. At present this legislation is “under going consultation” before enactment. Now is the time to make representations to the Secretary of State expressing concern that this legislation could have a devastating potential effect on vulnerable mobile home parks and drawing her attention to the events in Blewbury, Kings Lynn and the many sites which have made contact with Ladycroft. You may also like to contact our MP, Ed Vaizey to ask him to make similar representations to the Secretary of State and also to persuade him that there does remain a need for the type of behaviour we witnessed at Ladycroft, to be brought up in Parliament not only in the light of the recent Watchdog programme, but even more so if the legislation is enacted as currently proposed. Here are some samples of correspondence received by the Blewbury Bulletin following the court victory. It is refreshing to hear of a community that uphold the principles of fair play and decent behaviour as has been the case with your support of the residents of Ladycroft park, we on our park have also had problems with the park owner not to dissimilar from them and hope to learn from your example. I have been following the Ladycroft Court case, after reading posts on the Cambridge Evening News message boards. As I have a friend who is in a similar situation with his site owner, I printed all the information off for him for which he was most grateful. I hope it helps with his cause. The infuriating presenter, whose bland smile never slipped – does he not listen to his own stories? Hi from Worksop, North Nottinghamshire . My name is Steve and I’ve just seen the BBC Watchdog program concerning the above. I remember being incensed by this man’s bully-boy tactics when Watchdog first broadcast this case last year. I just wanted to say well done for standing up to this man and congratulations on the outcome of the court case. Generally speaking I have very little faith in the so called justice system in this country so it was nice to see common sense prevailing. The Ladycroft Residents won their fight against Mr Maurice Sines in an out of court settlement. The case was heard at Oxford County Court by Deputy Circuit Judge Michael Kennedy QC. The court order, issued on 21st October, binds Mr Sines to a number of undertakings. He is to pay the Residents a total of £73,000 in damages and is also to pay all the costs of the case. Mr Sines has to carry out all necessary works to electrical and gas installations, drains and roads to put them in good order by the end of 2006. The cost of these works is not to be recovered from the Residents nor may he seek to move any of them to carry out such works. Any works carried out shall be done is such a way as not to cause a nuisance and no units are to be broken up on site without a written surveyor’s report showing the necessity. He is not to interfere with the Residents’ fences and is to reinstate a retaining wall (not the front boundary wall). He is not to threaten abuse or harass residents, their families, visitors or prospective purchasers. He is not to interfere with the marketing or sale of Residents’ homes and is not to make any direct or personal contact with appointed estate agents. Mr Sines is to recognise the Ladycroft Park Residents Association as a consultative body. The Residents are each to have a car parking space within 30m of their pitch in addition to any they may already have on their pitch. Finally, if Mr Sines decides to sell Ladycroft Park a Third Party, representing Blewbury, is to be offered first refusal. Mr Sines was given notice that if he breaks any of the undertakings given to the court, he may be sent to prison for contempt of court. Never in their wildest dreams, did the Residents contemplate such a victory. Once again the Residents cannot thank the Villagers of Blewbury enough for their unbelievable generosity and support over the last four years; special thanks to the Silent Witnesses. Without the amazing community spirit of Blewbury, Ladycroft Park would not have survived. On Tuesday 4th October Sheila, Graham and Steve Akid together with Wendy Backhouse had a meeting with Mr Sines and his former solicitor, Mr Gromett. Mr Sines made an offer to settle out of court in which among other things he said we could have fences, but that any that had been taken down had to be replaced at our expense; he would only move units once and that we could sell on the open market without interference (a right we already have – in theory). This offer was considered by all the members of the Residents’ Association who voted unanimously not to accept the offer. On Friday 14th October Mr Sines made an application to the County Court in Oxford for an adjournment of the trial on the grounds of his no longer having either solicitor or barrister to represent him. Since Mr Gromett had retired a full two weeks previously and Mr Sines had chosen to change his barrister some time ago, the Judge ruled that he had had plenty of time to engage another solicitor who could have instructed counsel and that he still had two days to do so. Mr Sines was ordered by the court to pay £1250 costs to the Residents Association. We are very grateful to Helen Matthias for the Plant Sale she organized at her nursery, Church Farm Plants. It raised a total of £1024 for Ladycroft funds – £690 for plants and £334 for refreshments. Many thanks also to the helpers at the sale and to those who contributed the refreshments. The Court Case started at 10.30 am on Monday 17th October at The County Court, St Aldates, Oxford. At the recent meeting to discuss Ladycroft, the Vale was criticised for failing to take action on various problems on the site. I have investigated these complaints, as I have done in the past, and am satisfied that, with one possible exception, the Council’s officers have been doing everything within their power to address the issues at Ladycroft. The crucial point is that a public authority can only do what it is entitled to do by law, and the way in which it acts is invariably laid down by regulation, court decisions etc. The sad fact is that the law as it stands is far from helpful in dealing with Ladycroft. However, we must live with the law as it is, and not how we would like it to be, until someone changes it. The possible exception relates to a legal power (to do work in default) that the Vale says that it does not have and the only authoritive legal textbook on park home law would appear to support this view. However, the Secretary of State says that it does have this particular power and I have been in intermittent correspondence with the Office of the Deputy Prime Minister for some months to try to establish who is right. We are now busy getting ready for the trial which is scheduled to start on Monday 17 th October, but the fund raising is still going on. We shall be serving refreshments at the Plant Sale on 7th & 8th October at the Old Mill between 10.30 and 3.30. We would be very grateful for offers of help to man the coffee maker and also to provide home made cakes and biscuits. The Inside Out TV programme, in its first Monday evening showing on BBC1 South this season, showed many of the interviews and video clips which the BBC team has been collecting over the past few months, on the story of Ladycroft Park. Viewers were shown the present appearance of the site with huge piles of rubble, and several video clips of mobile homes being demolished shortly after having been bought at prices reportedly much less than their market prices. The site owner was reported by the BBC to have said that he intends to improve the site. The programme stated very clearly that mobile home owners and occupiers are poorly protected by legislation compared with the occupiers of permanent houses, and that some site owners are apparently taking advantage of this. The programme also showed very clearly how the villagers of Blewbury are doing a great deal to support the residents of Ladycroft. They interviewed members of the Silent Witness team of women – who watch many of the activities of the site owners’ staff to record possible legal violations, and provide the residents with a great deal of moral support. They reported the village’s many money-raising ventures. Blewbury has every reason to be proud of its support for the hard-pressed residents. Who Switched off the Electricity? The residents of Ladycroft Park were all ready to watch ‘Inside Out’ on their televisions just before 7.30 pm on Monday 5th September, when the electrical power to the whole of the Ladycroft site went off at 7.28 pm. We do not of course know for sure why it went off, although nowhere else in the village was affected. Police have received statements from witnesses that site workmen were seen by residents coming out of the local site electricity substation at that time. The residents only managed to get the power turned on again 2¼ hours later. Fortunately many people in Blewbury have recorded the programme on video, so anyone who missed it due to this ‘power cut’ can easily find a copy to watch. Ed Vaizey, our MP, paid a visit to Ladycroft Park on Wednesday 17th August. He met committee members and residents and expressed his continuing support and concern. Thank you to the many people who put time and effort into the fundraising events this summer and to everyone who came and supported us. Comedy store and summer dance on Tickers folly field: these 2 events raised a total of £1740.95 thank you to everyone who came along and supported us, we hope a good time was had by all. Car wash: £50.00 was raised for Ladycroft many thanks to Balan for this. Jazz night and Bridge lunch: Close to £4000 was raised from these 2 events thanks in part to the generous donation of alcohol funded by the profit from the dance and comedy store events. We have also collected £166.80 from the various collecting boxes around the village, thank you once again for all of your continuing help and support. Not too much to report from Ladycroft. Electrical work is continuing. Mr. Sines has bulldozed another unit, and pushed the occupier’s car into the middle of the road and fenced it off, so that the road is blocked. A skip is blocking another road. This is all done to cause a nuisance to the residents. The Council have been out and taken pictures of the open drains, broken manhole covers and piles of rubble. They are looking into what can be done about it. We are asking people of the Village to embark on a letter writing campaign to the Council, Ed Vaizey and various other bodies. COFFEE MORNING Thank you to everyone who came and supported the coffee morning held at The Willows in aid of Ladycroft. £220 was raised and everyone had a lovely time. BAND SINGALONG The Singalong and Cream Tea in the Playclose on Bank Holiday Monday raised a total of £1117.07 in aid of Ladycroft – a massive thank you to the Band and all who contributed from everyone on Ladycroft. Life at Ladycroft has been relatively quiet this month. Mr Sines was at the site on Sunday 15th May, driving around and playing loud music, but there were no incidents. Wendy Backhouse, our solicitor visited the site several times in preparation for the pre-trial court hearing which took place on Friday 20th May at Oxford County Court. This hearing was part of the process of preparation for the court case to be held later this year. John Connell from the Office of the Deputy Prime Minister who is involved with the new housing legislation, visited Ladycroft on Monday 16th May together with Officers of the Vale Council. They also took him to see other sites in the Vale. Despite many people’s disappointment, the BBC1 Watchdog programme did not include a report on what has been happening at King’s Lynn and Blewbury. The reason was that King’s Lynn District Council decided on the afternoon of 6th April, when the programme was to have been shown, to instigate Court Proceedings against Mr. Crickmore and Mr. Sines, for illegally starting a bonfire at King’s Lynn Mobile Home Park. Sheila visited King’s Lynn on 7th April to have a meeting with their residents and John Connell from the office of the Deputy Prime Minister. He is the leader of the All-Party Committee which is bringing in twenty new amendments to the Housing Act regarding Mobile Home Park Law. These will be brought in as soon after the general election as possible. Sheila and Graham went to London on 14th April to meet Linda Pearce (our barrister) at her chambers in Temple. Also at that meeting was Wendy Backhouse (our solicitor) and her assistant Rebecca. It was a positive and productive meeting. The next date we go back to Court is the 20th May. This is a pre-trial date, and the actual date for the main trial will be decided then. A letter has been delivered to various Blewbury properties, referring to the impending court proceedings between Sines Parks and many of the Ladycroft residents. It stated that in the event of Sines Park winning they will be seeking damages and costs, and will ‘be looking to the funders of the court proceedings to pay in the event of the residents not paying’. Several residents in Blewbury have taken professional legal advice on their potential liability relating to giving or lending money to the Ladycroft Park Residents in connection with their legal dispute with the owner of Ladycroft Park and they are confident that they are unlikely to be liable beyond what they may have loaned or given. Their attention has been drawn to the case of Hamilton v Al Fayed. Mr. Sines and his workmen have been away for most of the last two weeks, which has meant a more peaceful time for the residents of Ladycroft Park. However he did come down on Wednesday February 23rd and instructed his workmen to demolish the stone front wall at the entrance to Ladycroft park (see photos on page 1). Many residents and villagers were very distressed to see it go as it has been a part of Blewbury since the 1940’s. The council have said that a small part of the wall was in the conservation area, and so should not have been taken down without permission. However, now it has gone, they have told Mr Sines that he will have to submit plans to the council to say what will be going up in its place. He chose to demolish the wall on the day he was officially served with his injunction papers! On Wednesday 2nd March at lunchtime Mr Sines came down to Ladycroft, he went straight to No 53 which had just been vacated, picked up a large chunk of wood and smashed all the windows in the unit frightening many residents. There was broken glass everywhere. He then got back into his car and drove off. On Friday 4th March workmen came on site and dragged a large skip from the top of the site to the bottom with a JCB and proceeded to demolish no 53. On Friday 4th March Graham and Sheila went to Kings Lynn to visit another site, the lease of which is co-owned by Mr Sines. The residents there had written to us asking for help and advice. They have a solicitor who is fighting hard for their rights. The state of their site resembles ours. It was heart breaking to see, but makes us all the more determined to help put a stop to these unscrupulous site owners around the country. They met with approx 25 residents, who were extremely grateful for the advice, help and moral support that Ladycroft Park could offer. It was a very worthwhile visit, and they also met the solicitor dealing with the Kings Lynn case. We have also had correspondence from other parks owned by Mr Sines seeking our help, and from residents on other parks who are experiencing similar problems but with different site owners. We hope that the next fortnight will remain peaceful but somehow we doubt it will. The appeal that went out in last month’s Bulletin has produced a very encouraging response. The residents of Ladycroft have set ourselves a target to raise more between us. The route of legal aid has been looked into and we are claiming the full amount that we are entitled to claim. Thank you once again for your continuing support and generosity. An Injunction Order was served on Maurice Sines, owner of Ladycroft Park, at Oxford County Court on February 4th. Under the terms of the injunction, the Court ordered that “Maurice Sines is forbidden (whether by himself or by instructing or encouraging any other person) from a) damaging, removing or demolishing (i) any of the fences and walls around the perimeter of those pitches on Ladycroft Park which are not owned by the Defendant; (ii) any shed, porch or extension to the mobile homes located on pitches not owned b) from harassing, intimidating or molesting the residents on Ladycroft Park; c) from entering onto the pitches not owned by the Defendant without the permission of the occupying resident, such permission not to be unreasonably withheld.” A court case is scheduled for July 15th 2005 to settle the legal issues raised by events at Ladycroft to date. On Tuesday 18th January 2005 Sheila Austin, secretary of the Ladycroft Park Residents’ Association, presented a petition to Terry Stock, Chief Executive of the Vale of White Horse District Council. Signed by 770 Blewbury villagers, the petition asks the Council to ensure that the residents get all the assistance the Council is able to give them in their dispute with the landlord of Ladycroft Park. Maurice Sines purchased Ladycroft Park in June 2001. The site had 60 mobile homes on it. All were privately owned. A unit owner pays ground rent to Mr Sines who is responsible for maintaining the site and services. By the end of 2004 thirty seven were still in private ownership with three plots vacant. The other twenty homes had been sold, all to Mr. Sines’ company, and rented out. Renters were served eviction notices before Christmas. They had one month’s notice to quit, ending 8th January 2005. TO DATE Fifteen renters have left their homes. On 10th January the first of these was bulldozed. So far fourteen have been demolished or removed from the site. One empty home remains standing. Many hedges and fences have been torn down. Six renters remain in their homes. Mr. Sines is legally required to obtain court orders before these residents are obliged to leave. As yet he ha s not produced any orders. The thirty seven owners remain. Mr Sines has said he will need to move their homes to carry out redevelopment of the site. In the meantime he has told them to take down the fences, sheds and porches which they have had for many years, by January 30th . The following is an extract from the advice that the Residents’ lawyer sent to Mr Sines on 19th January, 2005. a.) You have no right to require residents to remove their fences, sheds and porches and you have no right to seek to remove them yourself. b.) You have no right to require residents to move into another mobile home or to physically move their mobile home for the purpose of redevelopment. c.) Your actions […………] amount to a breach of our clients’ right under their agreement to quiet enjoyment of their homes, for which our clients are entitled to an injunction and damages. We are also of the view that your actions may leave you open to prosecution for harassment under the Protection from Harassment Act 1997 and (in respect of any further incidents) under the new powers of prosecution in section 3 of the Caravan Sites Act 1968 as amended by section 210 of the Housing Act 2004. The police are monitoring the situation and have been on site frequently. The Didcot Herald has published two articles so far, and there have been reports on Radio Oxford, BBC South Television and Central News. If anyone has taken digital photographs of the site, please email them to [address now defunct]. If you have non-digital photos, please deliver or post them to [address now defunct]. The Silent Witness Group of 65 women has been set up to support residents . A petition of 770 signatures was delivered to the Vale on Tuesday 18 th January. There are 700 households in Blewbury. There is an email contact address [now defunct] for anyone to make comments, suggestions or offer help. Help can be offered in many forms. Sitting with a frightened resident, helping with chores like cooking, ironing, washing up, distributing leaflets, professional expertise. Please offer your time and support wherever you can. We are looking for a painting posse to paint the outside of a couple of the homes soon – a boost to morale. A couple of hours or offers of paint would really help.